Once again we (Ryan, my father and myself) headed off to Tuff Truck. 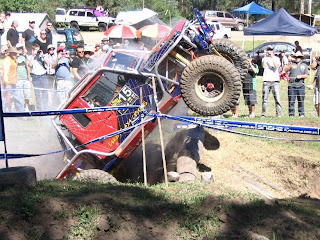 This is the hardest short course off-road 4x4 competition held in Australia. If your truck doesn’t come away from the weekend without some damage or a scratch then you haven’t driven it hard enough. Milbredale, near Singleton once again hosted this year’s event. 42 of Australia’s best 4WD vehicles were pitted against each other as well being judged on ‘show n shine’ ‘engineering’ and 8 of the hardest individual events I’ve seen. These vehicles include features like; 4 wheel steering, 42” tyres, hydraulic pump-up suspension, plus lots more. Arriving early on Friday we were surprised at the size of the crowd that had already made this area their home for the next few days. Crowds over the weekend would swell to over 10,000 by the weekends end. A split field sees half the trucks head off to a mystery night stage on the Friday night while the other half tackle the mud event. This is reversed on the Saturday night, thus giving all competitors a far go at each stage. During the 2 days competition each vehicle must complete 6 gruelling tracks. Many trucks at one point or another had to be recovered from a point where they no longer could drive. Some even had to be returned to the ‘right way up’ before they could be recovered. Parts were breaking a phenomenal rate. CV’s, trailing arms, pinions and body panels were no match for these near impossible tracks. By the end of the weekend less than half the starters would be remaining, it was simply that demanding on machinery. The eventual winner, with one of his best performances ever, was Pete and Taz in their new 40 series Landcruiser. I cant wait till year.